OK, WE HAVE scanned images of junk rigs and some diagrams drawn from the major junk-sail books ...all I need is a little time to adapt them and illustrate the various flavors of junk sails. IT IS ASTONISHING but there's very little information online covering Chinese junks and sampans and the junk rig in general. Here is a list of plans, books, articles, and things like that. See Lessons from a Chinese Sampan for a discussion of lines, rig and construction. See The Chinese Sail by Brian Platt, an excellent essay that hasn't been published before in this form. Drawings and photos, might be a little slow to load. There is my tutorial on building your own Chinese balanced lug sails based on various sources. It's easy. They publish a couple Newsletters a year; they're more active in the UK than in America, but the info is universal and the club burgee (flag) can't be topped! the first junk to visit the USA and Britain. The visit was in about 1845. This photo dates from around 1885 and is in the Special Collections at the US Naval Academy Library. It's not at all clear this is actually that junk, one source did indeed indentify it by that name. Perhaps there were two junks by this name. Or maybe this is a type that is nearly identical to the original. Cherie Northon's wonderful junk photo. See more in color at her home page. A junk with matting sails (see the tutorial). "The Chinese ships are of three kinds : the big ones are called joncos, sing. jonc, the medium ones azzana and the little ones the alkakame." and the type is well described, inclusively stating that some have several masts, and one, captured after a fierce combat, had four layers of sheathing, being almost invulnerable to artillery fire. The Portuguese employed junks in big numbers and brought one from India to be a warship in the "Esquadra do Estreito", the Gibraltar Strait Fleet! The only terms used are Junco and Junquo (pl.Juncos-Junquos). Sampan is not found in Portuguese oriental documents until the 18th century. From: c.r. pennell: No one seems to have quoted the OED yet! 5. 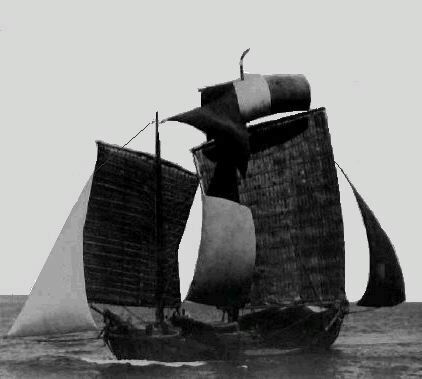 Worthless stuff, rubbish (colloq) 1913.
a name for a common type of native sailing vessel in Chinese seas. It is flat-bottomed, has a square prow, prominent stem, full stern, the rudder suspended, and carries lug sails. a. To cut off in a lump; to cut into junks or chunks. b. To treat as junk; to 'scrap' 1916. Considering China's size and economic importance it's amazing how few books in English there are on Chinese watercraft. Oh well. Some books include Chinese craft in a chapter or a separate section. Some others which turn up in English bibliographies are in French. I have marked books that are in print with [*]. For the others you'll have to try libraries or used bookstores. Some books have a Library of Congress catalog number; these are taken from the Mariner's Museum's excellent online library catalog. The classic reference book in English. Many sketches and some photos. Huge. Some people can't get through it. Others, or at least me, have read it 4 or 5 times. There are several editions; it was reprinted in 1971 by the Naval Institute Press. More of a social history. Sketches and some photos. Abridged material from Junks and Sampans plus some new material and photos of some of the collection of junk models held by the British Museum. New material drawn from his articles in Mariners' Mirror. Pen and ink sketches of junks along with stories, etc. More 'atmospheric' than not. Published in 1925 in Shanghai. This has an abbreviated set of lines and offsets for the 3 masted junk "China Cloud", which was located for years in the Vancouver area. This boat has twin bilge keels and seems to have been built to a junklike overall form using western building techniques like plank-on-frame. Owned by Allen and Sharie Farrell, it appeared at least once in WoodenBoat. Mainly a photographic record of a cruise. Many nice shots of a nice boat. Pictures of a collection of junk and sampan models with good descriptive text. Some general background information in the opening essay. One of the only photos I've seen of 'paneled' bamboo matting sails (imagine hanging a series of wide rectangles from a mast, and tying another on or untying one when you want more or less sail). This is considered by many to be 'the bible' of junk rigging, but in reality it describes, or perhaps overdescribes, one particular geometry developed for Hasler's transatlantic racing. For all that it's full of interesting information, and if you're an engineering type you'll appreciate the authors' mania with geometries and proportions. It's a little to analytical to be a "cookbook" but it comes close. Originally published by International Marine, 1988. Down-to-earth manual on rigging your boat with formulas, sketches, and specific recommendations. Unlike Hasler he does not believe in multipart sheets, unlike Colvin he does not believe in the 'euphroe', so see other sources for traditional styles of sheeting. Out of print but you may be able to find this one in your library. These three books both have some material - perhaps a chapter's worth - about junk rigs on Western hulls. The text about the origin of world sail types is somewhat out-of-date but here are excellent drawings and photographic plates. I've finally found all ten volumes. See this page for contents and sample plates. In French: "Sailboats of Indochina (Vietnam)". Very interesting detail sketches, and a good companion to the Blue Books (below) since it covers some of the same locations. Published in 1949 in Saigon. From the 1980s, a good "coffee table" book about the vanishing traditional junk in and around Hong Kong. Many color photos. Not a technical book. I found a copy in Harvard's Yenching Library; it seems to be difficult to locate. See also Colvin's books above. An examination of the Treasure Fleets of Cheng Ho in 15th century China. Worth reading, but it has significant errors in marine architectural understanding. I also don't believe there were ever any 400-foot wooden junks which were 160 feet in beam. Maybe a few 200-footers. Since Chinese "feet" varied wildly, I'm sure there was some hanky-panky in this department. by S.P. Jorgensen with Capt. Ah Lin. I haven't seen this volume either. by Neil Hollander and Harald Mertes. Some information on the Hasler type rig, and a dimensioned example of a mainsail from a Tom Colvin junk. Otherwise, much valuable info on sail materials and sailmaking, certainly a must-have book for anyone who's fascinated by sailing rigs. Bolger can't quite reconcile himself to the junk rig, but has come around recently to experimenting with a "Chinese gaff sail", that is, a battened gaff sail with multiple sheets. In any event, this happens to be a great little book. See pages 50-53, 120, 128-130, 158-159 and 232-234 (this last a battened square sail). Intended as guides for naval personnel during the Vietnam War, there are Vietnam editions from about 1962 and 1968. The Blue Books are in both English and Vietnamese (or Thai) and include many pictures. Unfortunately the shots are not as sharp as they could be in many cases. Includes quite a bit of additional information on coastal fishing and trade. The Green Books are condensed editions for use when actually on patrol. The Vietnamese Blue Book probably has the best collection of photos of Vietnamese basket boats, that is, hulls woven of bamboo matting. The Thai Blue Book has very few sailing vessels, but the introductory history is worth a read. The books seem to be hard to find, although I've been told that in the 1970s they were clogging the used bookstores in and around Washington DC. Norbert: "In German but with many good drawings. From this drawings some true sailing models are made." I can't find this book through Interlibrary Loan. Warington Smyth's Five Years in Siam (1898) includes a lengthy description of a coastal voyage in a junk-rigged western-hulled boat, with sketches. Many editions beginning 1878, and one of the best short descriptions of the traditional sail and rigging. International Marine published a version of the 11th edition, annotated by John Leather, which should be relatively easy to locate. See drawings from the 1878 edition elsewhere on the Cheap Pages. Paris is well-known for documenting canoes and proas of the Pacific. Since I haven't seen these three books, I can't tell you how much junk or sampan material they contain. They are in the rare-books category. I hope to be able to obtain reproductions of the most interesting plates through the Naval Academy. We'll see. Souvenirs de Marine: collection de plans ou dessins de navires et de bateaux anciens ou modernes, existants ou disparus avec les élémens numériques nécessaires à leur construction. Six volumes. Also known as: Collection des navires et piroques. Collection des navires et pirogues construits par les habitants de l'Asie, de la Malaisie, du Grand Océan et de l'Amérique / dessinés et mesurés par M. Paris. Anson's epic voyage around the world happened from 1740-44. To one of his lieutenants, Peircy Brett, we owe the first planof a proa ("The Flying Proa of the Marianas") and sketches of shipping near Macao. Unfortunately it seems Brett's journals and sketches remain unpublished and hidden in the Public Records Office in England. These are enlarged from a gritty illustration from Leo Heaps' Log of the Centurion which excerpts the journals of Philip Saumarez, another lieutenant. Heaps' book, and Richard Walters' Anson's Voyage Round the World are both excellent seafaring stories. John Webber, artist on one of Cook's voyages, drew some junks and sampans when the expedition stopped at Macao on its way home (c.1777). These can be seen in the four-volume Art of Captain Cook's Voyages. These sketches have remained obscure for several hundred years. Worcester did not know about them. Click on the thumbnails for larger images. There's no text accompanying them - in those days guys like Webber traveled along as "human cameras". Many of Webber's drawings of Polynesian vessels are found in Dodd's excellent book, Polynesian Seafaring. The Yangtze Pelican (email Muriel Short for study plans and info). This is the only small-boat plan I'm aware of that specifies a Chinese battened lugsail. One under construction in aluminum: the Yangtze Project. For a western-built hull and Chinese rig, see the book Sailing Back in Time, above. The lines are included but sketchy; the boat was built western plank-on-frame style, but it is junk-rigged and generally junk-shaped. Yves Tanton sells a plan called the Sea-Egret, a 30' junk rigged sharpie. See his ad in WoodenBoat. It much resembles the Bolger AS-29. Salty's sells a sampan-like pram which can optionally be rigged with a lugsail - no reason you couldn't add battens to this one. The Smithsonian's Ship Plan List: William Maxwell Blake Collection. 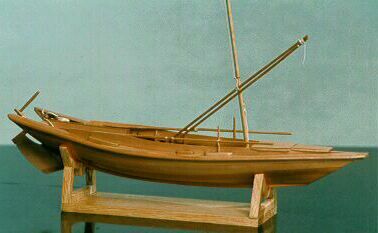 Except for the smallish sampan, which is still fairly large, these are ships ranging up to 115 ft. Buy the plans and scale them down! Junks were built by formula and eye, not by drawn plans anyway. Around 1928 or 1929 YACHTING published a series of short articles by William Maxwell Blake, who measured Eastern watercraft he found in Singapore and elsewhere. The various plans cover different rigs and different types of hull and construction. Some of his drawings appear in the second edition of Warington Smyth's Mast and Sail in Europe and Asia. Obtaining plans from the Smithsonian's collection is a little confusing. There is an unillustrated catalog, which isn't the clearest document in the world, and they do not have study plans. Some vessels are on a single sheet and others have two or more sheets to the plans. The info below gives you pricing for the complete sets for each boat. The junk-rigged vessels are WMB-1, WMB-2, WMB-4, WMB-5 and WMB-13. 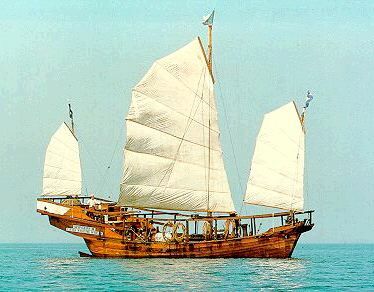 WMB-1 is a Sampan of about 35 ft and is probably your best bet for an authentic set of plans of a "junk hull" since the line between a junk and a sampan is typically one of beam only. They are shaped much the same and built much the same. These plans represent the Singapore hardbor version of the sampan; the sampan is (or was) a Southeast Asian utility boat. The complete set is $13/three sheets (Lines; Deck plan, construction, oar, details; and Sail, Spar and Rigging Plan). They are to 1" scale and are exceptionally complete if the catalog is to be believed. The Twakow is a 57-foot two-master with a radically inclined foremast. Lines, sections, sails, spars and rigging are $5/one sheet. You might well be able to scale this vessel down by half to have a daysailing junk, although it will take some care to get the proper rig proportion on a much smaller hull. WMB-1 and 5 are each $5/one sheet; WMB-13 seems to be the least detailed, $3/one sheet. To order all 7 sheets of Blake junk plans is $31. To order only the Sampan and Twakow, for example, costs $18. Plus, there is a charge of $5 for shipping and handling for 1 to 12 sheets. More than 12 sheets means another $5; more than 24 sheets means another $5, and so on. So make a check out to the Smithsonian Institution for $36 for all the junk plans. You'd pay $23 for just the Sampan and Twakow so get them all. Canadian and foreign orders must be in US funds drawn on a New York bank. (Hey, I only relay what the catalog says). Similarly, all the Indonesian plans will run you $46 for ten sheets, plus the $5 shipping charge for $51 total. Junk-rigged western-hulled yacht plans are available from Jay Benford, Jacques Mertens, Tom MacNaughton and Tom Colvin. A chapter on using a two-masted Hasler style rig for cruising is found in Annie Hill's Cruising on a Small Income, in print and available from Jay Benford (Tiller Publishing) and other sources. Don't buy the book if all you're interested in is junk rig; but if you'd like a lot of common sense on cruising the world, by all means get it. In the UK contact the Junk Rig Association. Also reprinted in The Rudder Treasury: Lessons from a Chinese Sampan. by A. Nilson (October and November 1924). As of May 2001 I still haven't copied these to look over. by Dr. E. A. Petersen. Cruising about in a junk. A series in the late 1930s. I haven't followed up on these articles either and I'm not sure how the Horn comes in, but after WWII a book called Hummel Hummel was published by Dr. Petersen. Readable, but not great. China Cloud (boat): design, photos (#67, p. 19): see the book by Coffey, above. He slags the lugsail but admits the battens and sheeting are a great idea. He presents his adaptation, a battened, multisheeted gaff rig. A good introduction in three short pages, but probably impossible to find. Info from this excellent article, plus an update, in the Junk Rig Tutorial. I need to find an index to The Boatman. Anyone? Short article on the replica of Hasler's famous junk-rigged Folkboat. Several very good photos and a simple diagram of the sail rig. Traditional boatbuilding on a riverbank. Burmese boats have the big sampan stern and a raking straight stem. Good photos. Building a traditional Vietnamese sampan and adding a Western rig. Excellent construction photos of a Vietnamese boatbuilder, Bay Thu, at work. A later short piece about Bob's sampan appears in an American magazine, either Cruising World or Sailing. I'll try and find it. Articles on Chinese boats and Chinese lugsails by Worcester and others, mostly in the context of maritime history. whose grandfather was I.A. Donnelly. Once or twice a year; available to members of the JRA. Many articles on cambered junk sails and fancy batten schemes. Writing, by members, can be the pits. Now there's a Junkrig discussion group on Yahoo Groups. You may have to get a member name to access what used to be the eGroups pages (ugh). Colvin tests the junk rig on a series of sharpies. Interesting. Illustrations. Yachting 1928-29: The original series of plans by William Maxwell Blake (above).